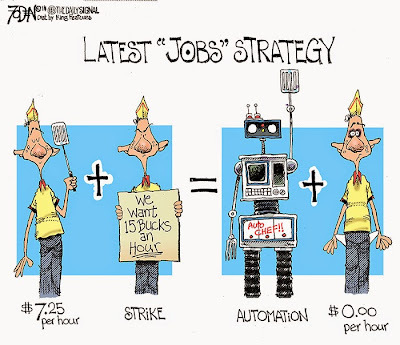 As Neel Kashkari said in the debate, the time for incrementalism is over. It is time for bold reform to put more Californians back to work. ...California hasn’t made the comeback Brown touts. The most accurate study, which takes into account cost of living, states that California is No. 1 in the country in poverty. 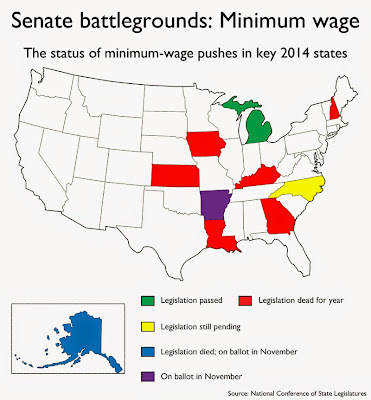 Californians know that a dollar doesn’t go as far here as it does in most other states. Taking cost of living into account means taking reality into account – and by that measure, as Neel Kashkari points out, far too many Californians are suffering, and that is unacceptable. California is No. 1 in poverty because so many are out of work or working part time. California continues to grow in population, but the job market is not keeping pace. While by the most narrow of definitions unemployment might be lower, every serious person understands that this is largely a result of the worst labor force participation rate since the Carter administration. Not every state is doing poorly. 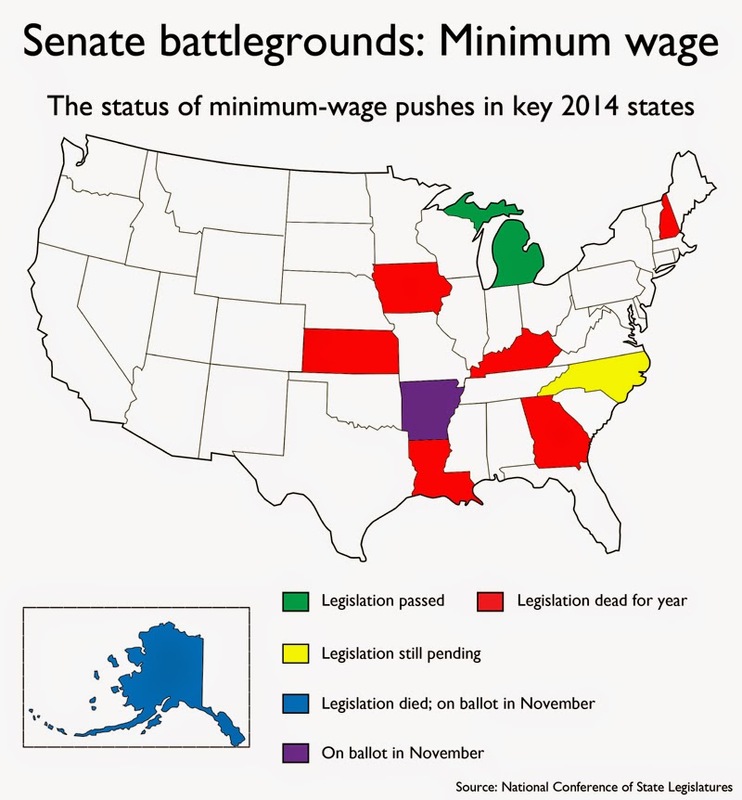 North Dakota has a labor shortage because of its policies. 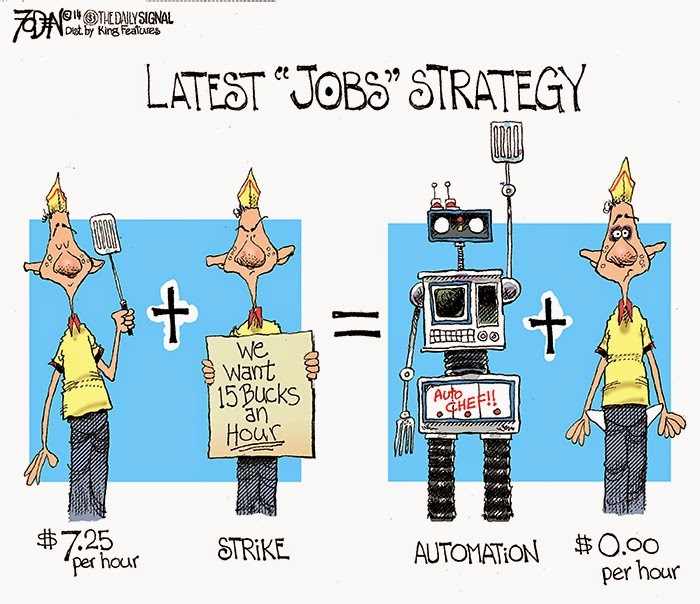 To be sure, there are parts of the economy, such as the tech sector, that are doing quite well. Have Brown’s policies caused that, or did private initiative build it? The answer is the latter – and in many cases they succeeded in spite of Brown’s policies. In the last four years, the cost of doing business in California has risen substantially – unless you received a special tax break from Brown. Tax rates, workers’ compensation costs and the costs of regulations have risen. Some of that is the fault of Gov. Arnold Schwarzenegger, but Brown has only made them worse. "It's going to actually be better for people. They'll have more choice," Emanuel said. "Most people who work for an employer and get their coverage through an employer do not have choice." A Wall Street research firm S&P Capital IQ went even further than Emanuel's prediction to say that 90 percent of plans would disappear within the next 10 years, according to Fox News' Jim Angle. Angle reported that analysts see this happening because the $2,000 Obamacare penalty is cheaper than the cost of the average employee's insurance. If the predictions are correct, up to 150 million people will be pushed onto Obamacare out of their tax-free employer-sponsored plans. Aside from low tax rates and business-friendly workplace laws, Nevada offered plenty of sun and wind to generate “green” power. The industrial park is only about 200 miles along Interstate 80 from Tesla’s lone auto assembly plant in the San Francisco Bay Area. It’s also near a deposit of lithium, an essential element to produce the battery cells. The news comes as a surprise to absolutely no one. Nevada does, after all, have the only active lithium mine in the country, which is helpful if you’re in the lithium-ion battery business. It’s close to Tesla’s current manufacturing complex in Fremont, Calif. It has access to a considerable amount of wind and geothermal energy. It has a whole lot of sun — which is useful when your CEO also happens to be chairman of a solar panel company (as is the case with Tesla’s CEO, Elon Musk, and the solar panel manufacturer Solar City). It’s a tax haven – no personal income tax, franchise tax, estate tax, corporate income tax or taxes on corporate shares. And it apparently offered Tesla one of the largest incentive packages in the history of automotive plants. 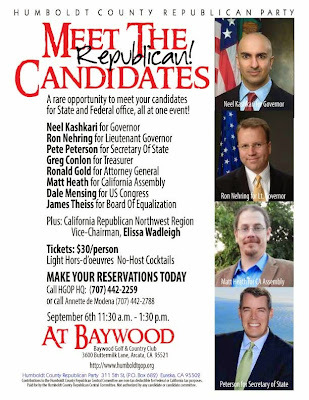 ◼ Losing Tesla was a key topic in gubernatorial debate. 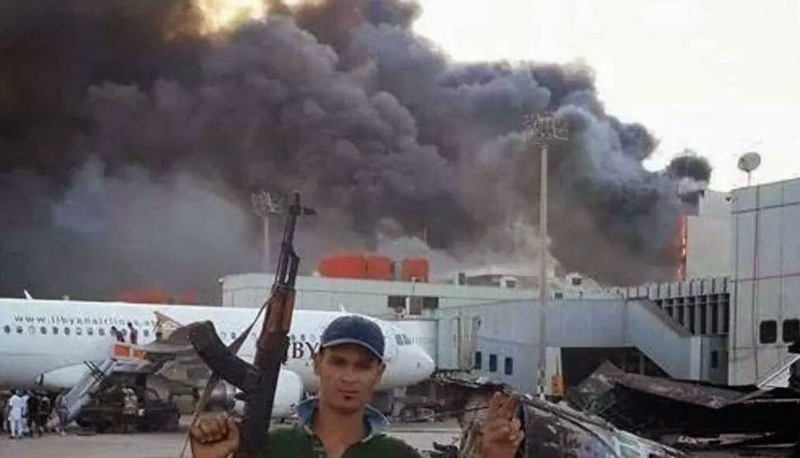 STAND DOWN ORDER DID TAKE PLACE - CONFIRMED BY MEN WHO WERE THERE AS THE BENGHAZI MASSACRE TOOK PLACE. 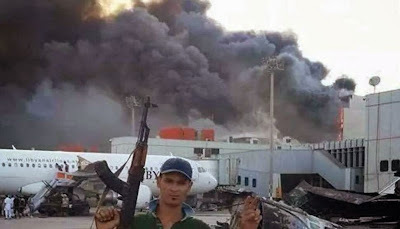 “We're starting to get calls from the State Department guys saying, ‘Hey, we're taking fire, we need you guys here, we need help,’” said Paronto. RIGHT HERE in Humboldt County! The Internal Revenue Service (IRS) improperly obtained donor lists from nonprofit groups as part of a “secret research project” being run by Lois Lerner and other officials. ◼ The focus on Islamist radicalization in the Somali immigrant community in the Twin Cities has mostly focused on the men, and on al-Shabaab in their homeland. That focus in both cases has broadened, as WCCO in Minneapolis reported yesterday evening. ISIS has stepped up its online recruitment of women in English-speaking countries, using cheery videos of frolicking children and an emphasis on the need for nurturing their terrorist fighters to draw teens to the fight in Syria and Iraq, far from both the West and their own heritage. 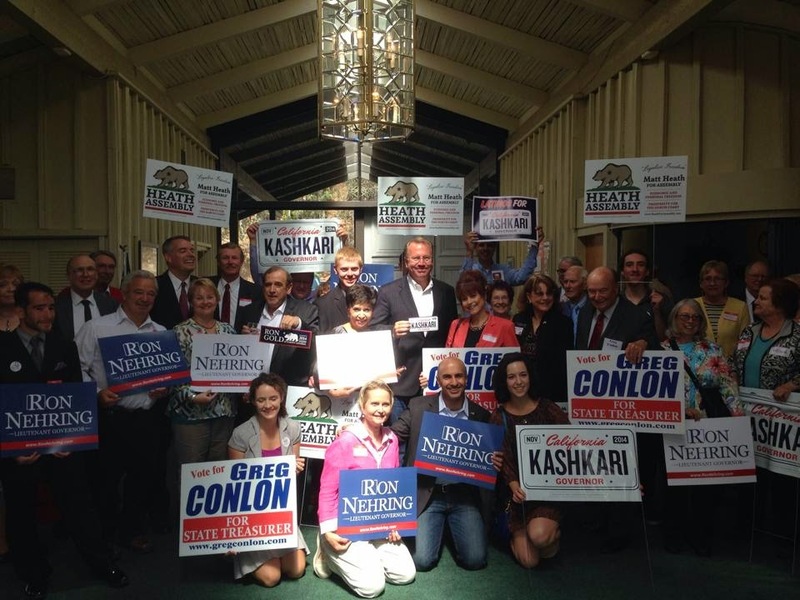 Two veteran political analysts said they thought Kashkari won the debate. "His answers were crisper and more direct," said Jack Pitney, a political science and government professor at Claremont McKenna College. "And he stayed on focus. He kept bringing the debate around to the topics he wanted to talk about, which were jobs and education." Bill Whalen, a research fellow at Stanford's Hoover Institution, said "the governor was not knocked down," but agreed that Kashkari did better in terms of style and points. "He was more coherent than the governor," Whalen said. "More times than not, the governor went off into Jerry Brown mode where he was not answering the questions." Tesla Motors’ decision Thursday to build its giant electric-car battery plant in Nevada instead of California came at an awkward moment for Gov. Jerry Brown. The announcement was made hours before this year’s first and only California gubernatorial debate. Sure enough, the Democrat received an earful during the televised forum from Republican candidate Neel Kashkari about the exodus of companies from the Golden State. Kashkari. He won just by showing up and appearing on the same stage as Brown That provided more attention than he’s gotten in the campaign. But he did better than that. He was sharp, to the point and offered a critique of Brown that’s dead on—the governor is an incrementalist in times that require much bigger changes. His performance was strong enough that Brown complimented a few times on his salesmanship. Brown. He was still breathing at the end of the debate, all but assuring that he’s winning a new term. Hey, did y’all watch the California Gubernatorial Debate last night? LoCO’s instareaction was that poor old Jerry Brown got creamed by crazy-eyed Republican slickster Neel Kashkari. 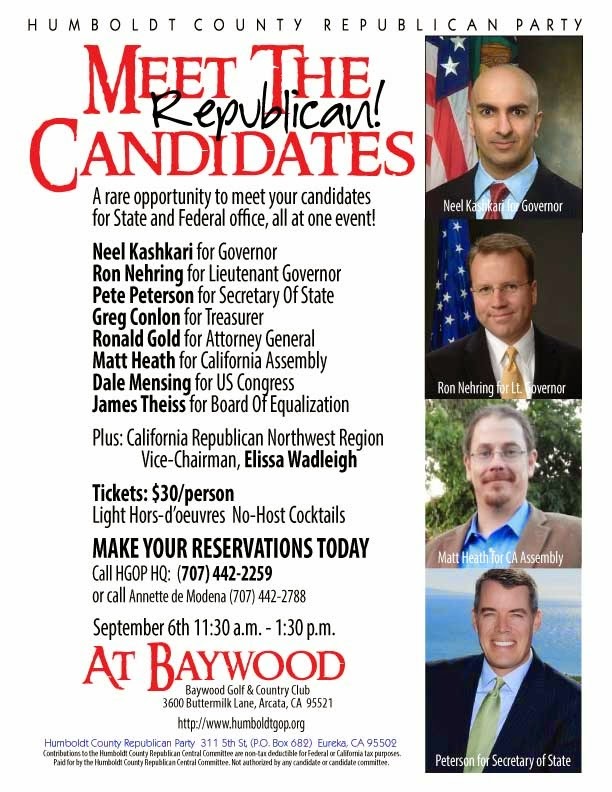 ◼ Meet The REPUBLICAN Candidates RIGHT HERE in Humboldt County! As a candidate for lieutenant governor I am asked to speak many groups. One of the first questions I am asked is along the lines of, "Is this job important?" My answer it that it can be and should be important. A main duty of the lieutenant governor is to assume the duties of the governor if he leaves the state. In our state the governor and lieutenant governor are not elected together. As a result, the ones elected often represent different political parties. There is a long-standing unwritten agreement that the lieutenant governor will do nothing to disrupt the governor's programs should he leave the state. That arrangement is fair. In addition, the lieutenant governor is chairman of the California Commission for Economic Development. It is charged with addressing regional or local economic development problems and making recommendations for solving them (to the governor and Legislature). With the state's spotty economic recovery, this commission should be busy meeting with citizens and business, professional and civic leaders in various parts of the state to gather and refine ideas for strengthening local economies that need it. Another of the commission's responsibilities is to provide a forum for dialogue on economic issues between state government and the private sector. Is the 16-person commission doing these things? No. 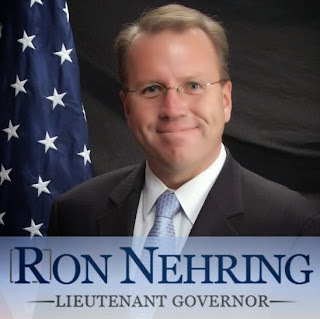 In his nearly four years in office the current lieutenant governor hasn't managed to get a quorum appointed so that it can hold meetings, let alone fan out around the state to get opinions and make recommendations for action. I am a Republican who thinks the composition of this commission should reflect the realities of California, politically, geographically and demographically. The lieutenant governor, by law, is also a member of the Board of Regents of the University of California, the Board of Trustees of the California State University system, the State Lands Commission, the California Emergency Council and the Ocean Protection Council. If he does his homework he can be a positive influence on all of these. Add up these duties and you have the makings of a full-time job, which is the way I would treat it. The incumbent, Gavin Newsom is quoted as saying of the job, "It's just so dull." He also told an interviewer the he goes to his office in the state Capitol, "one day a week, tops." No wonder. He is co-owner of PlumpJack, company that owns seven bars/restaurants, three wineries, two resorts and a catering company. 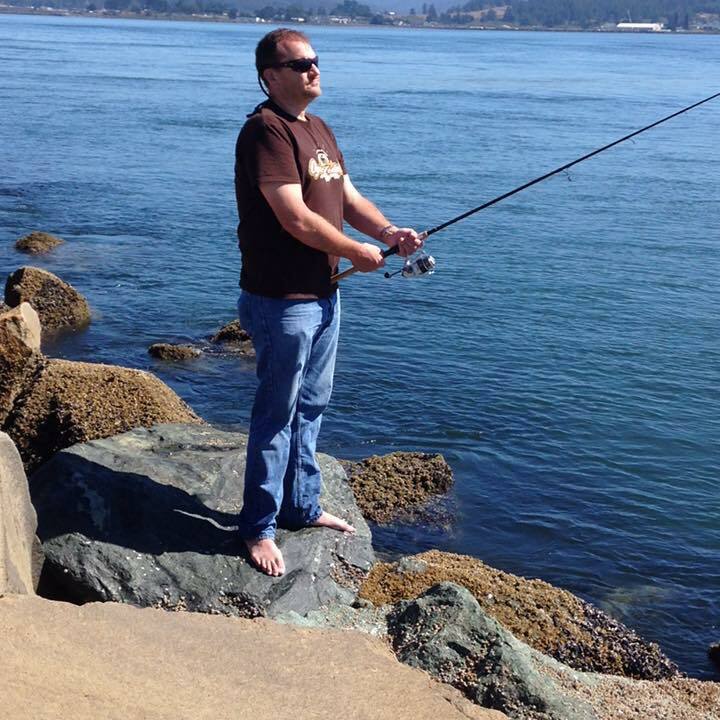 Nearly a year after he took office as lieutenant governor, his sister, who is president of his company, told a San Francisco reporter, "I've never seen him busier. Now that he doesn't have any more local conflict (he had been mayor), he's back involved in the PlumpJack business." Mr. Newsom claims that he has declined to accept the lieutenant governor's salary of nearly $124,000 a year. At a glance it may seem commendable that he's not taking state money for not working, but he was elected to do a job and do it well. He has acted as if the position is an honorary one. It's not. My parents were immigrants from Europe. They taught me that hard work was worthy and that opportunities would appear, including public service. If I am elected I will thank the voters by giving them an energetic full-time public servant determined to make our state once again Number One. Ron Nehring is the Republican nominee for lieutenant governor. He is a small-business owner and educator, having taught democracy and governance classes in several emerging democracies in Eastern Europe and Eurasia. 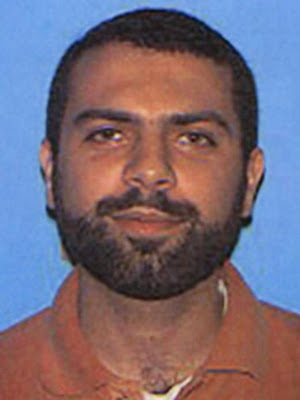 The FBI is looking for Ahmad Abousamra, 32, is a Syrian-American who is wanted on federal terrorism charges. He is suspected of running the ISIS social media campaign. He is seen here in a photograph taken in 2004. A wanted terrorist and American college graduate has eluded capture by the FBI, but officials suspect he’s all over social media. Ahmad Abousamra, 32, who graduated from Northeastern University in Boston and is suspected of joining the extremist Islamic State, is believed to be using his social media skills to run the terrifying group’s cyber operations, ABC News reported. ...Terrorism experts said the extremists are savvy at recruiting English-speaking supporters to spread their venomous messages on Twitter and Facebook. American voters preferred a more comforting fiction manufactured by Barack Obama and his backers which promised that the threat of Islamic fundamentalism had receded. They were wrong, and the establishment of the Islamic State brought with it a wealth of unimaginable new horrors. The usual cast of characters will emerge to scoff and mock, too. It’s all they have left. Russia invades, China bullies, Iran spins centrifuges, the Islamic State (a terrorist threat “beyond anything that we’ve seen,” according to the defense secretary ) threatens — and Washington slashes the military. Reason stares. 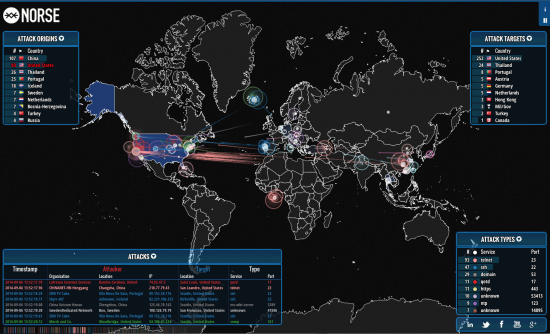 Several arguments are advanced to justify the decimation of our defense. All of them are wrong. Some argue that the United States should simply withdraw its military strength from the world — get out of the Middle East, accept nuclear weapons in Iran and elsewhere, let China and Russia have their way with their neighbors and watch from the sidelines as jihadists storm on two or three continents. Do this, they contend, and the United States would be left alone. No, we would not. The history of the 20th century teaches that power-hungry tyrants ultimately feast on the appeasers... READ IT ALL, AT THE LINK. ◼ The Howard Jarvis Taxpayers Association has launched a new website giving California taxpayers objective information on the initiatives that will appear on the November 4 ballots. The new website, which can be accessed at http://www.CAInitiatives2014.org offers latest news related to the propositions, brief summaries of each proposal and short descriptions of arguments for and against.” The site also offers links to the text of the measures themselves and links to the websites of campaigns on both sides. Among the important measures that will appear on the ballot are two that could affect Californians’ access to healthcare and a water bond proposal that some believe could help solve the state’s chronic water shortages. The website will be updated regularly as developing news occurs and as additional campaign organizations are launched. 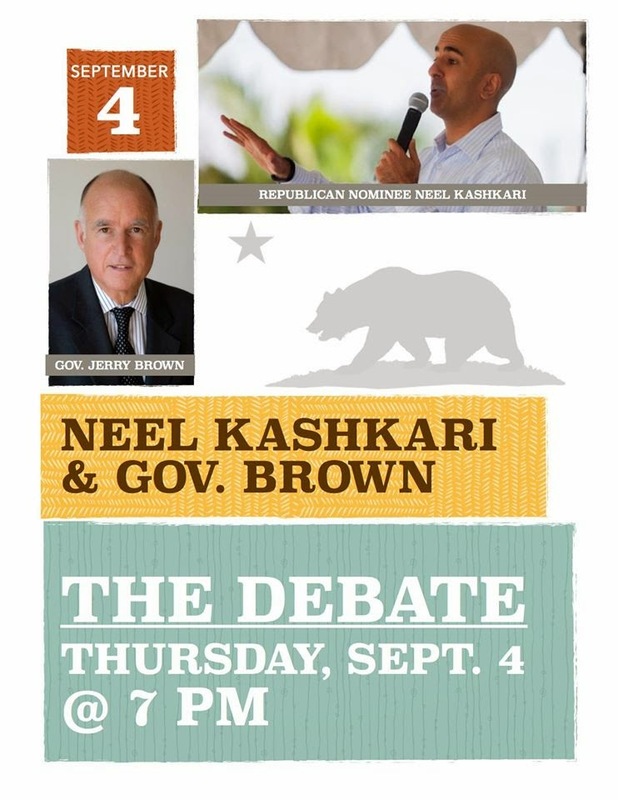 Breitbart California’s Editor-In-Chief Joel Pollak has penned ◼ some pre-debate analysis that underscores the distinct challenge facing Kaskari--analysis that is worth reading before you tune into tonight’s 7pm hour-long debate, which is being ◼ streamed live on the CalChannel website. KQED, the Los Angeles Times, Telemundo52 and The California Channel are proud to present the California gubernatorial debate for the 2014 election, which will be held on Thursday, September 4, at 7pm at California Channel’s Sacramento studios. The one-hour debate will be broadcast live on statewide television and radio and also be streamed live on the Web. The debate will be moderated by John Myers, the senior editor of KQED’s new California Politics and Government Desk. Panel of journalists for the debate include Times Editor-at-Large Jim Newton and Telemundo52 Morning News Anchor Dunia Elvir. Just this week Psaki has refused to call Russia's invasion of Ukraine an "invasion," wouldn't say America is at war with ISIS, couldn't clarify what President Obama meant when he said he wanted to destroy ISIS while also "managing" them, wouldn't confirm if passports belonging to Americans knowingly fighting for ISIS have been revoked and said she wasn't going to "put labels" on the beheading of American journalist Steven Sotloff. The Obama administration doesn't "have a strategy yet" about how to deal with ISIS but they sure have a strategy down about how to attack and whine about Fox News. 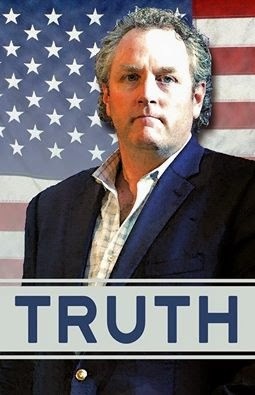 Have no fear America, we're in good hands. According to the latest poll released Tuesday by Field Poll, only 45 percent of voters approve of Obama's job performance. This is the first time that fewer than half of California voters are happy with Obama's performance as president this year. Tuesday's results also show that Obama's approval ratings have slipped since June. Mark DiCamillo, the head pollster at Field Report, said the trends are particularly ominous because the decline in numbers come from Obama's own supporters. He’s had slightly lower disapproval numbers, hitting 56 percent earlier this year, but his approval’s never been below 38 percent in Gallup. He sunk that low twice in August 2011, during the dog days of the first debt-ceiling standoff, but never dipped below it. Think about that. Despite the many lowlights of his second term, from the Healthcare.gov rollout to the NSA scandal to the IRS fiasco to this summer’s comprehensive foreign-policy mess, he’s never been lower than he is right now. Is tomorrow the day he breaks new ground? The silver lining for Democrats, if there is one, is that his approval’s not in freefall. He’s been stuck just a few points above today’s numbers for most of the summer and yet Democratic Senate incumbents remain competitive in all battleground states. The dark cloud that holds that silver lining is that this ◼ isn’t the (only) poll lately showing O nosing south. Ten days ago, Reuters also had him at 38/54, identical to today’s Gallup figure. The new YouGov poll has him at 41/56. (Rasmussen, by contrast, has him at a robust 47/51.) If he settles in at, say, 38/55 for the rest of the midterm campaign, Democrats can wave bye-bye to Mark Pryor, Kay Hagan, Mary Landrieu, Mark Begich, and probably some purple-staters like Mark Udall too. See now why Debbie Wasserman-Schultz has taken to using ◼ domestic-violence metaphors to attack big-name Republicans? When the head of the party is lurching towards sub-40 percent approval, it’s most definitely kitchen-sink time. Via ◼ Ace and the ◼ Free Beacon, here’s John Kerry rolling out a winning new message for the Democrats’ fall campaign, that the Bible requires Christians to save Muslim countries from global warming or something. Exit question: Does Obama’s sinking approval make an executive amnesty for illegals more or less likely? The Washington Post, in its now well-known “Fact Checker” column, gave Earnest’s remarks a rating of Four Pinocchios. In other words, the attempted answer to Alexander’s question is a “Whopper.” In yet a different phrasing, it was a lie. Obama is showing the world what it would look like had America never been born. He treats the ever growing threat of ISIS as an abstraction. Sources from within the administration are now more openly admitting that for almost a year intelligence and Pentagon officials have advised the President of the threat. He has chosen to do very little. Last Wednesday, he said we would “shrink” ISIS and make it “a manageable problem” as opposed to eliminate it. ...On taxes, voters favored Republicans 48 percent to 42 percent. On foreign policy, Republicans ruled again, 50 percent to 40 percent. On the federal budget and spending, the gap was even wider, 51 percent to 38 percent in favor of Republicans. The most troubling number for Democrats concerned the economy. Republicans were favored by likely voters over Democrats, 49 percent to 42 percent. Economic issues still rank No. 1 when it comes to voter concerns, according to an August Gallup Poll. ...Patrick Sookhdeo, international director of Barnabas Fund and an expert on radical Islam, notes that Dabiq is mentioned in a hadith that prophesies an end-time battle in which Muslims will conquer Christians, en route to conquering the entire world. By officially declaring the Islamic State illegal, Israel will now be able to take legal action against anyone raising funds or associating with the terror organization in any way. “This is being done for the sake of national security, public safety and public order,” the declaration states. Unfortunately, this visionary overhaul has burgeoned into a federal government power grab. In its current capacity, the standards may end up hurting our already failing education system and overlooking our children’s unique needs and the diversity of the country at large. Many education wonks have found the new curriculum only debatably superior to the previous standards of some states. Massachusetts, for instance, one of the nation’s strongest academic achievers, will undoubtedly be worse off with the adoption of Common Core. The new standards in math, English, and language arts are also not making any significant gains toward international standards. A study conducted by the dean of the University of Pennsylvania’s Graduate School of Education found that Common Core is failing to live up to its promise. ...When last we left former President Barack Obama, he was scooting off to Europe to do something-or-other that will persuade Vladimir Putin to halt his slow-motion invasion of Eastern Europe. A herd of reporters chased him to Marine One and begged him to make some kind of statement about ISIS beheading another captive American, journalist Steve Sotloff. Hope that Obama would reconnect with the real world, spin on his heel, and provide a burst of leadership was written on the faces of his media admirers. “Don’t hope for any positive outcome” would make a fine slogan for the Obama lame duck years. "We will not be intimidated," Obama said during a joint press conference in Estonia. "Their horrific acts only unite us as a country and stiffen our resolve to take the fight against these terrorists. And those who make the mistake of harming Americans will learn that we will not forget, and that our reach is long and that justice will be served." The president’s comments came the morning after the Islamic State of Iraq and Syria (ISIS) released a video depicting the beheading of American journalist Steven Sotloff, and two weeks after the terror group released a video similarly depicting the death of American journalist James Foley. “Whatever these murderers think they'll achieve by killing innocent Americans like Steven, they have already failed," Obama said, pledging an international effort against the "the kind of barbaric and empty vision that [ISIS] represents." "Our objective is to make sure the ISIL is not an ongoing threat to the region. 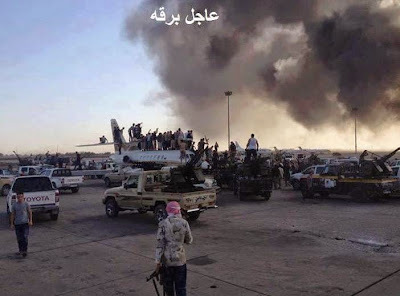 We can accomplish that,” Obama said, using an alternate acronym for the group. Separately, the White House on Wednesday confirmed that U.S. intelligence had deemed the video showing Sotloff's beheading to be authentic. "We know that if we are joined by the international community, we can continue to shrink ISILl's sphere of influence, its effectiveness, its financing, its military capabilities to the point where it is a manageable problem," said Obama. "And the question is going to be making sure we've got the right strategy but also making sure we've got the international will to do it. This is something that is a continuation of a problem we've seen certainly since 9/11, but before and it continues to metastasize in different ways. And what we've got to do is make sure that we are organizing the Arab world, the Middle East, the Muslim world, along with the internationl community to isolate this cancer." 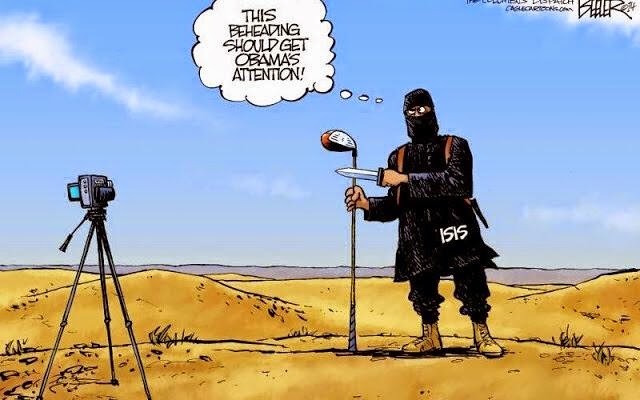 Obama will fire word missiles at ISIS. That should do it. Secretary of State Kerry: "the face of Islam is not the butchers who killed Steven Sotloff - that's ISIL"
Paul Rahe, currently at Hillsdale College, is an eminent scholar whose many books combine awesome erudition and bedrock common sense. He is also a member of the American Political Science Association and attended that organization’s annual convention in Washington over Labor Day weekend. The president's departure came amid equally deafening swirls of helicopter rotors and tough questions about whether and when the U.S. will strike back in a meaningful and public way against ISIS, the self-proclaimed Islamic State of Iraq and al-Sham. News of Sotloff's execution broke online at 1:05 p.m., shortly after White House Press Secretary Josh Earnest began his daily briefing with reporters; he said four minutes later that he hadn't heard the news. ...it’s clear that the only part of the job that truly engages Obama is the set of perks the office provides, which means he’s not going to simply walk away from the Presidency, even if history provided more precedents for it than it does. He’s not going to marry himself to Richard Nixon for eternity, after all, not willingly at least. As a strategic demand, then, this is an exercise in futility. As a cri de coeur, however, it succeeds — and highlights once again the growing consensus that Obama is out of his depth on national security and foreign policy. MARK LEVIN: And why, why is he the last hold out? ELI LAKE: Oh I think the president is in some ways a prisoner of his own ideology which is in many ways defined as he will do the opposite of what he perceived the last administration would do in a situation. But I think he also worries that what comes after, what comes next. So, let’s say the US forces liberate Raqqa which is a Syrian city where we know that ISIS is in control because of the Vice News video. Well then who would administer Raqqa? That’s what I’m getting from administration officials sympathetic to the president’s view. But at a certain point you have to say what’s worse than this new caliphate beheading journalists in the middle of Syria right now. And it’s hard to imagine what would be worse than that. White House Press Secretary Josh Earnest was taken by surprise when a reporter asked him about the video during a regular Tuesday press briefing. BREAKING: Family spokesman: Sotloff relatives aware of beheading video by Islamic State, are grieving. ◼ As promised last Friday, one day after President Obama announced that “We don’t have a strategy yet” on dealing with ISIS, British Prime Minister David Cameron addressed the House of Commons Monday to address the terrorist threat posed by ISIS. ◼ Senate Intelligence Committee chair Diane Feinstein called President Barack Obama “too cautious” in his response to the ultra-violent jihadists in ISIS, adding he was “wrong” to call them a jayvee team back in January. Time and CNN became all about the liberalism, not journalism. Liberals didn’t like Lou Dobbs? Then make his life at CNN difficult until he leaves. Liberals on the march in Ferguson? Put it on the cover of Time with a liberal slant. Obama? 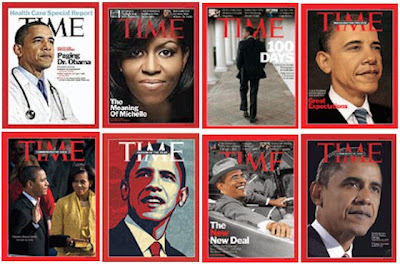 Put him on over a full one-quarter of Time’s 52 covers for 2008. Now, as with Newsweek, the results of decades of this liberal tilt are in. 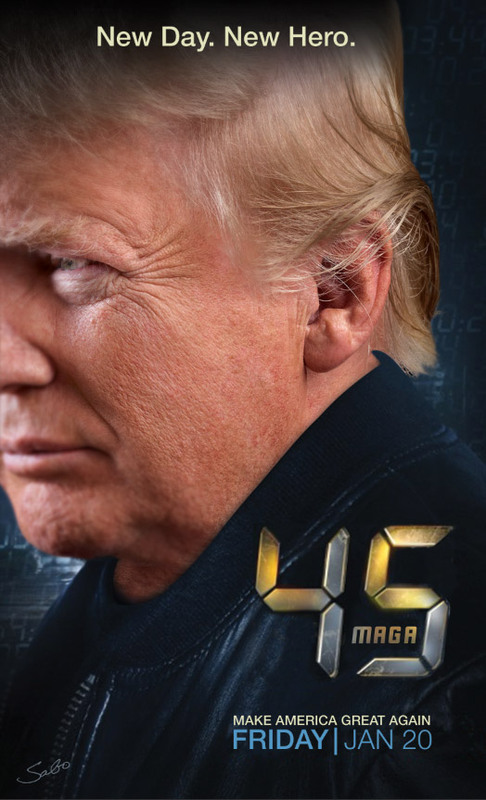 Time has been spun off with its staff laid off by the hundreds, and CNN is about to face massive layoffs, its ratings in the basement. But no matter -- the liberalism will still reign supreme. What is remarkable here is the obsession with liberalism even if it comes down to a question of survival. Given a choice of going the straight fair-and-balanced route that has made Fox News the place-to-go for news and opinion, the response is journalistic suicide. So now here come the layoffs at CNN. Will CNN change direction? Of course not. Neither will Time. Their financial, circulation and ratings life blood draining away, CNN is still as scornful of Fox as Time editors are doubtless proud of all those fawning Obama covers. Newsweek died even as its editors still glowed with pride about putting Sarah Palin on the cover in running shorts and snickering "How Do You Solve A Problem Like Sarah? She’s Bad News For The GOP - And For Everybody Else Too." Time and CNN are dying. And unless they change, they will die. Why? Because in effect, liberalism is proving to be the Ebola of Journalism, its deathly effect spreading from Newsweek to Time to CNN -- and doubtless beyond. ◼ Does Antarctic Sea Ice Growth Negate Global Warming Theory? LA Times making frantic excuses,,, - Watts Up With That? Eric Worrall writes: The LA Times has published an article which asks whether the faithful should worry about the rapid growth of Antarctic sea ice, an observation which sharply contradicts model predictions that the ice should all be melting away. Naturally the article concludes that their readers should not be worried. 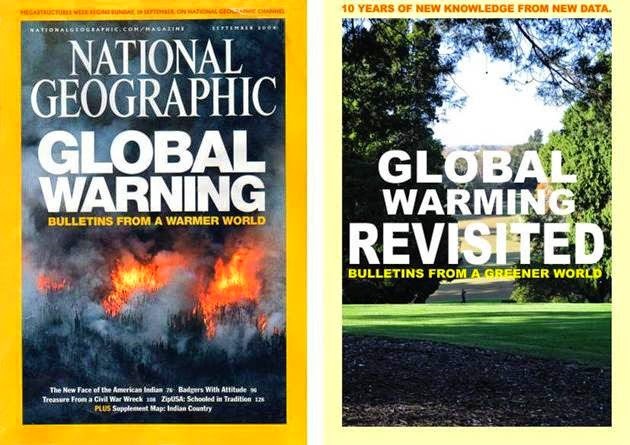 ◼ National Geographic’s Warming Warning – 10 Years Later - Watts Up With That? 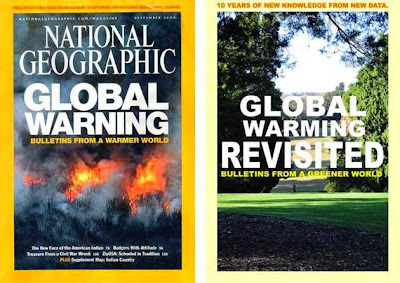 Geoff Sherrington writes: National Geographic Magazine had a Global Warming issue in September 2004. New instruments have given new data. By planning now, NatGeo can make a revised issue 10 years later, in September 2014. The 2014 edition should aim to correct what is now known to be wrong or questionable in the 2004 edition. ...To the Editor of National Geographic, we are a third of that way to that very different world and many can’t pick the difference yet. Given the possibility that NatGeo 2004 was an enthusiastic issue, we think it would be a good idea to bring out a more measured NatGeo 2014. Our blog readers are a skilled and diverse. They will prepare and distribute the actuality of the NatGeo 2004 claims as understood in 2012. Please feel free to use these in the re-write, a step which would gain you prestige because scientifically, it is the ethical move. Just What Exactly Is Net Neutrality? And Why You Should Be Worried About It. ...the ultimate irony of the FCC’s discriminatory approach to net neutrality. It has been sold as a means of protecting Internet startups when its real purpose is to protect existing or emerging non-ISP monopolies in mobile operating systems, search engines, online advertising, and online video distribution. In addition to stifling competition with their direct rivals, these monopolies could become so powerful that they stifle competition among mobile ISPs as well. The end result wouldn’t protect the ‘open Internet’ — it would merely shift net neutrality advocates’ concerns over gatekeeper control upstream from ISPs to other participants in the Internet ecosystem. If the FCC wishes to preserve competition in the mobile Internet segment, its best bet is too maintain a light regulatory touch that maximizes opportunities for market negotiation. If the FCC won’t do that, then it should apply whatever net neutrality rules it adopts to all mobile Internet gatekeepers, ISP and non-ISP alike. Reinstating the FCC’s ISP-only approach to Internet regulation is by far the worst option for regulating the mobile Internet. We already know where that market distorting road leads: To new monopolies in the middle. "Don’t worry, there’s just a few Americans waiting to have their heads cut off in the custody of this terror group."